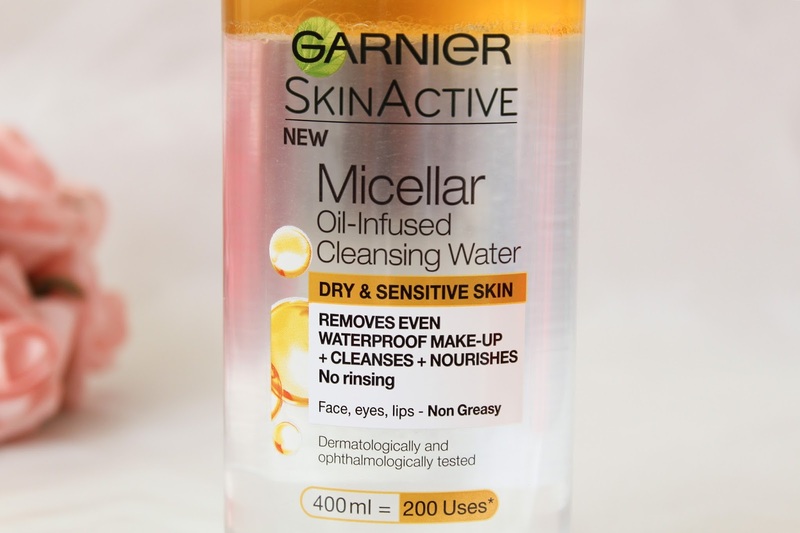 Garnier Skin Active Micellar Oil-Infused Cleansing Water | Review. Micellar water is definitely the skincare product of this year and last. Every makeup and skincare brand out there has brought out one. I had tried out a few Micellar waters and I never got on with them, some made my skin feel dry or really greasy afterwards. Others that I tried either irritated my skin or broke me out really bad, which is unusual for me. 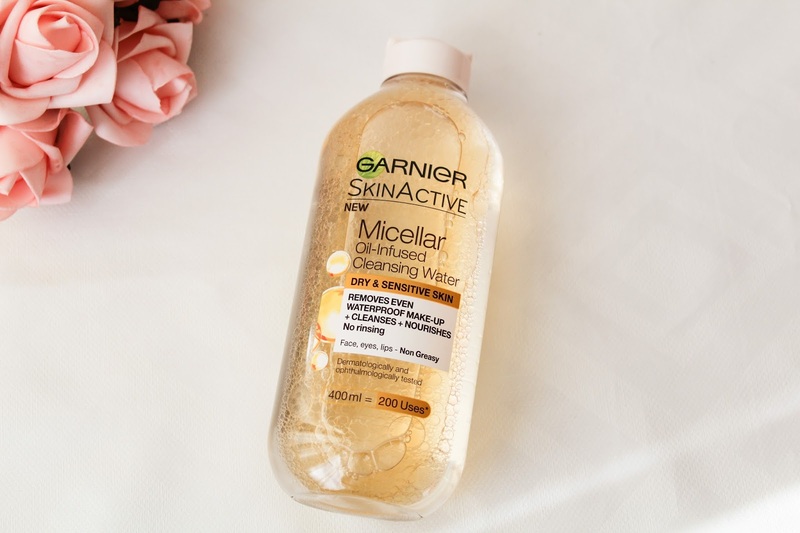 That was until I found this little gem from Garnier, The Skin Active Micellar Oil-Infused Cleansing Water and it is an absolute game changer to my skin care routine. Before I start to review this product I feel like we should make sure that we are all on the same page with micellar water. It isn't an ordinary toner water, the water instead contains little oil balls called micelles that are attracted to oil and dirt. These then help to draw out all the impurities in the skin without drying out the skin and it can also cleanse and remove makeup at the same time. 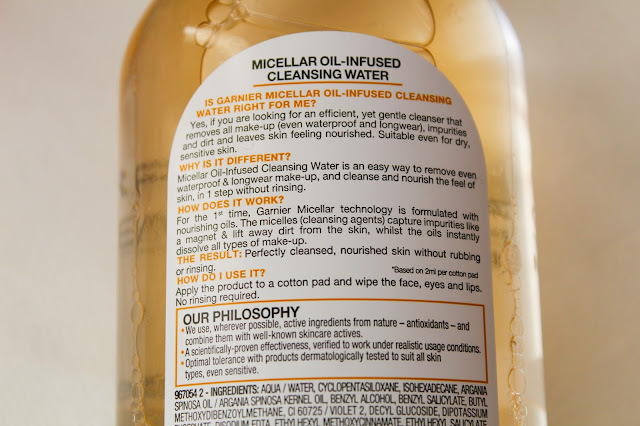 The thing that makes the Micellar Oil-Infused Cleansing Water different from the others is that it has a layer of pure oil in it as well as those cleansing micelles. Hello lovelies, I hope you all are having a great Easter weekend! I have been using this Micellar water for a few months now and I absolutely love it. As I mentioned before I didn't get on very well with other Micellar waters that I had tried out so when a new version with argan oil launched not that long ago by Garnier, I had to purchase one. My skin is quite sensitive so I have to be careful on what I use as anything could cause it to break out or develop some sort of rash. So I was a little sceptical about trying this and I made sure that I read some reviews on it beforehand to see what other people thought about it. This Micellar water was designed for sensitive and dry skin and the first thing that caught my eye was the fact it was an oil-infused cleansing water and the layer of oil that sits on the top. Like I mentioned, this product is targeted towards people who have dry or sensitive skin, which many people suffer from. It is really effective at taking off my makeup even waterproof makeup such as mascara. It's effortless to use as it doesn't pull or drag at the skin around my eyes. It doesn't irritate or sting my eyes in any way like some other makeup removers or wipes do and it leaves your skin feeling fresh and so smooth. I have also noticed that you don't need to wash your face afterwards as it doesn't leave any kind of sticky or greasy residue. My skin doesn't feel tight or sore after using this product, instead it feels soft and smooth. 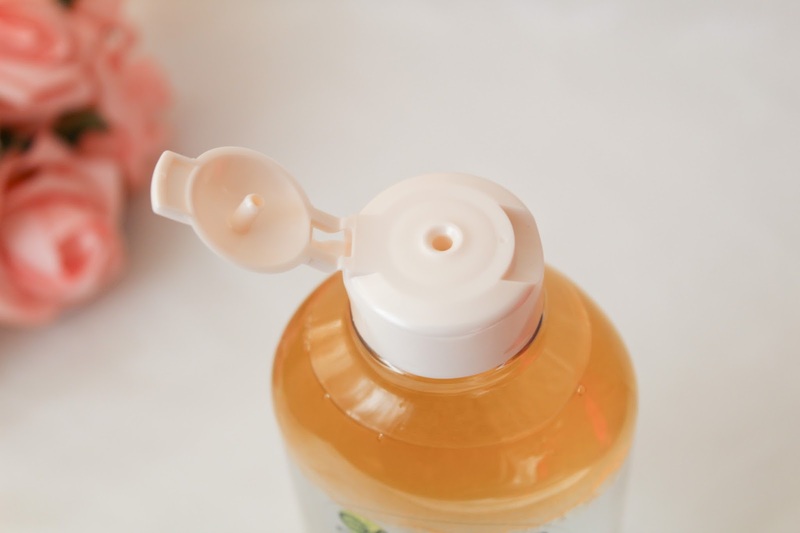 Using this cleansing water is super easy, all you have to do is shake up the bottle first to make sure that the layer of oil on top mixes with the Micellar water well. I then take a large oval cotton pad and squeeze a small amount onto it and then gentle move this across my face. I like to use the large oval cotton pads as they cover a large area of my face at once. This Micellar water removes all makeup and that's including waterproof makeup and leaves your face fresh and cleansed. What I love so much about this Micellar water compared to the other ones that I have tried is that it doesn't sting my skin or eyes, doesn't break me out and it combines makeup removal, moisturising and cleansing all in one, which is perfect if you are like me and feeling lazy some a lot of the time. This stuff makes it so easy to take off your eye makeup, just hold the cotton pad over your eye for a few seconds to help melt away the makeup, and then gently wipe it away and make sure to be gentle on the lower lash line too. Another plus of this is that you don't get panda eyes and have a black mess all over your face haha! This Micellar water has a warm, subtle but rich scent that is quite floral. I don't find the scent strong at all like some other people have mentioned in their reviews, it's a nice scent to have when taking your makeup off. If you don't like any scent in your makeup removers then I would suggest that you get a tester before you buy this. The bottle of Micellar Oil-Infused Cleansing Water claims that there are 200 uses inside, that makes this product an excellent high street buy but even if I only get half of that I would be happy given the low price. I am currently sharing this with my mum, as she tried it out after me and fell in love with it too, so it will definitely not last that long! On my first impression, I loved the packaging which looks sleek and also functional by having the flip top lid that allows controlled dispensing of the product. The goldish orange colour on the packaging matches the oil that is inside. I also like the fact that the packaging is a clear plastic bottle so that you can see how much is remaining. The packaging clearly shows that the Garnier Micellar Oil-Infused Cleansing Water is targeted towards those with sensitive and dry skin and based on the ingredients I think that this is a perfect choice for someone who wants something that won't irritate their skin. At £5.99 for a generously sized 400ml I think this is such a bargain. The original Garnier Micellar Cleansing Water is only £4.99 but I believe that for an extra £1 you are getting a brilliant product that is definitely worth it and is good value for money. Garnier is often on offer either in Superdrug, Boots or even Asda, so you can get it even cheaper. I purchased this from Boots which is nationwide so I am pretty sure that you could get hold of one. All in all, this Micellar Water has become an essential part of my skincare routine and I don't think I will be using anything wlse to take my makeup off. By using this, it makes it so easy and effortless to take off all my makeup without my skin hurting or my eyes stinging. 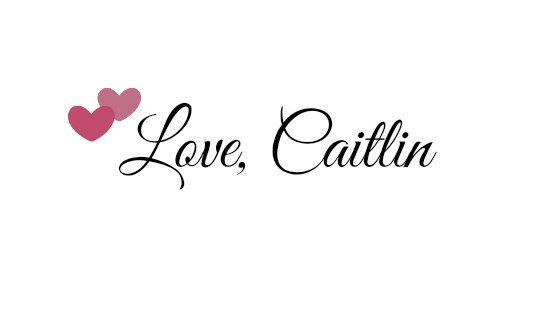 I absolutely love this and it has changed my life! Also, it is only £5.99 which I think is a bargain considering how much you get and how long it lasts. Have you tried this product or do you have a particular favourite Micellar water? Let me know your thoughts in the comments below.